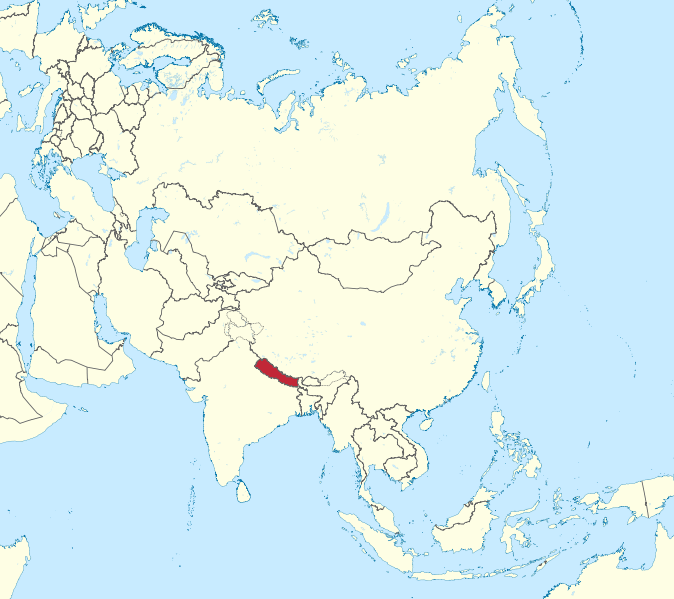 Nepal lies in the south of Asia and it is bounded on the north by the Tibet Autonomous Region of the People's Republic of China and on the east, south and west by several Indian states. The capital city is Kathmandu. 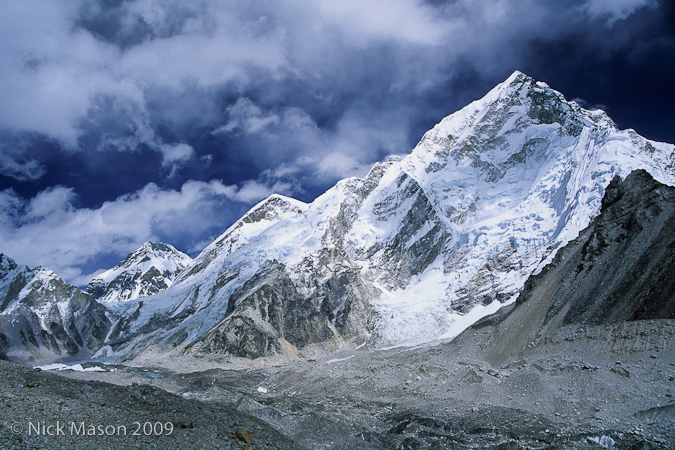 Nepal is a land of extreme contrasts in climate and geography. It has a unique topography ranging from lowlands with sub-tropical jungles to arctic conditions in the Himalayan highlands. Within a mere 150 kilometers the land rises from near sea level in the south to over 8000 meters in the north. This, together with the monsoon rainfall along the south facing slopes, has resulted in compacting virtually all climate zones found on planet Earth. As a result, Nepal has been endowed with a great diversity of life-zones providing a home for a large variety of plants, birds and animals. To many visitors, the Himalayan Kingdom conjures up the images of snow-capped mountains and rolling green hills. Indeed, out of ten world’s tallest mountains, eight stand in Nepal, making Nepal a mountaineer’s dream. But Nepal has much more to offer than just the high breathtaking Himalayas. A small country, Nepal is diverse geographically as well as ethnically with more than 61 ethnic groups and 70 spoken languages. The visitor will find rich cultures and vibrant traditions, exquisite temples and monuments as well as fast flowing rivers and tropical jungles teeming with wildlife, making your trip an unforgettable experience. It is the only Hindu Kingdom in the world. However, all the people from different races and religions live in harmony and there is an ideal blending of Hinduism and Buddhism. Air and water pollution are significant environmental problems in Nepal. Roughly one-third of the nation's city inhabitants and two-thirds of all rural dwellers do not have pure water and the use of contaminated drinking water creates a health hazard. Untreated sewage, agricultural runoff, and sedimentation and discharge of industrial effluents are prominent sources of pollution. The burning of wood for fuel is a significant source of indoor air pollution and respiratory problems. Vehicular and industrial emissions increasingly have contributed to air pollution in urban areas. Deforestation affects a great proportion of the population and has the worst consequences for economic growth and individuals’ livelihoods. Forest loss has contributed to floods, soil erosion, and stagnant agricultural output. Estimates suggest that from 1966 to 2000 forest cover declined from 45 to 29% of the total land area. Often cited causes of deforestation include population growth, high fuel wood consumption, infrastructure projects, and conversion of forests into grazing- and cropland. According to government estimates, 1.5 million tons of soil nutrients are lost annually. Land degradation is attributed to population growth, improper use of agro-chemicals, and overly intensive use of landholdings that are too small to provide most households with sufficient food. Government policies have attempted to address these numerous and related problems, but policies often are hampered by lack of funding, insufficient understanding of Nepal’s mountain ecosystems, bureaucratic inefficiency, and sometimes contentious relations between the central government and local communities. In 2001, 28 of Nepal's mammal species and 27 of its bird species were endangered, as were 7 plant species. 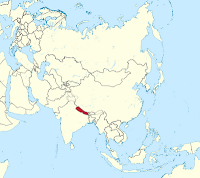 Species classified as endangered in Nepal include the snow leopard, tiger, Asian elephant, pygmy hog, great Indian rhinoceros, Assam rabbit, swamp deer, wild yak, chir pheasant, and gavial. UNEP has warned that more than 40 Himalayan glacial lakes are dangerously close to bursting because of the ice melt caused by global warming. Rapidly melting glaciers means more seasonal variation in river flow, which will in turn result in more floods and draughts in the country. This will also result in more Glacier Lake Outburst Floods, which can be disastrous to communities and infrastructure along the rivers. Other impacts of climate change can be reduced agriculture production, loss of biodiversity, increased desertification and changes in social structure. Donating for a common purpose has long been popular in Nepalese society. Urban people donate more than rural people because the income of the rural areas is comparatively low. In a population survey, 68% of respondents were involved in charitable activities on a regular basis. There is no previous concrete study regarding the percentage of people involved with CSOs in Nepal. However, for the last few years, in conjunction with the downsizing of the state, people in all spheres of life have been attracted towards such CSOs. There is a high degree of willingness to join CSOs. Overall, 55% of respondents are members of at least one CSO. In rural communities, the majority of the people are associated with CSOs such as the community forestry groups. The population survey reflects that overall, 22% of CSO members belong to more than one civil society organization. Most people in the rural areas participate in community level volunteer activities. Engaging in community work is less common among urban Nepali people. Volunteerism in Nepal is mainly divided into mutual aid and self-help, philanthropy, service to others, participation in self-governance and campaign advocacy. The population survey showed that volunteer services are provided in sectors such as training, labour, social, economic and intellectual cooperation, economic and physical help to those experiencing social difficulties, help for poor people, providing awareness programmes, offering financial support through savings programmes, or running adult literacy classes. People spend an average of 15 hours per month in various forms of volunteering. Some of the laws such as the Environmental Impact Assessment Law (1996) have made public participation a mandatory step. Similarly, the Local Self Governance Act (1999) places emphasis on public participation for community level activities. 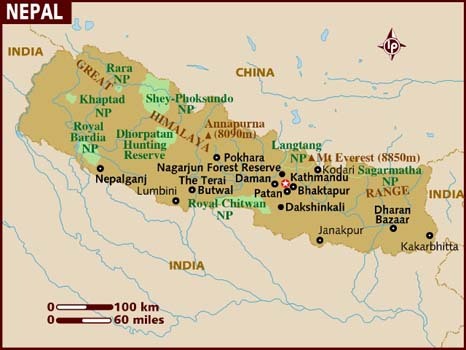 Because of its rich biological and cultural diversity, Nepal until recently was referred to a “Shangri-la”. A consequence of this has been a significant tourism industry as one of the main areas of economic development. In the last few years there has also been impressive growth in community forestry. CSOs and conservation groups have prioritised environmental awareness and conservation activities. They are involved in educating high school students throughout the country about a wide range of environmental issues, and advocacy groups have begun to increase awareness through public meetings about urban pollution issues arising from emissions from vehicles and industries like brick kilns. Examples of civil society public campaigns, actions or programmes dedicated to protecting the environment relate to awareness of the need for environmental protection; forest conservation and reward system; tree plantation and environmental pollution control, and forest preservation and community forest users group. The media review also reflects a similar trend with a fairly high coverage of articles on environmental concerns, including CSOs actions to promote environmental sustainability. Nepal Environmental Policy and Action Plan (NEPAP) analyses the country's environmental issues in multi-sectoral framework and sets forth a strategy for maintaining the country's natural environment, the health and safety of its population and its cultural heritage as economic development occurs. NEPAP was prepared in response to growing awareness about importance of maintaining a balance between economic development and environmental conservation. The cases of prevention and control of pollution have been strongly reflected in the Environment Protection Act and Environment Protection Regulations of the country, which came into effect in 1997. The Environmental Protection Act (EPA) as a framework legislation covers the essential aspects related to environmental protection: the requirement for IEEs and EIAs; inspections; the provision of authority to establish protected areas; testing facilities; the establishment of a fund; the establishment of the necessary administrative mechanism; the establishment of EPC; penalties for violations of the Act; and the authority to enforce guidelines and standards. The Nepal Government/National Planning Commission and IUCN developed and endorsed the National Conservation Strategy (NCS) for sustainable management of natural resources and the protection of the environment. The NCS for Nepal was prepared jointly as an inter-sectoral umbrella policy at the national level for addressing environmental issues during the development process. Other environment-related laws are: Forest Act (1993), National Parks and Wildlife Conservation Act (1973), Aquatic Animal Protection Act (1961) and First Amendment (1998), Water Resources Act and Water Resources Rules (1993), Electricity Act (1993), etc. In 2010 the Nepali Prime Minister announced that a new environment protection policy will be formulated so as to protect the country’s fragile ecology, but there is no indication on whether this commitment has been fulfilled yet or not. There are few corporations in Nepal which espouse the concept of social responsibility. A study on the status of corporate social responsibility in Nepal conducted in 2003 revealed that “the business cannot create wealth and thrive in an island of poverty.” The study, which examined 100 companies, presented an unclear image of CSR, and highlighted diverse perceptions of CSR among key players, such as corporations, CSOs and government, and also the importance of CSR within the industrial sector. The role of industries in CSR is increasing and many more companies are becoming keen to fulfill their social roles and responsibilities. The Federation of Nepalese Chambers of Commerce and Industry (FNCCI) has established a separate unit to promote CSR activities in the country. The respondents to a regional stakeholder consultation assessed that corporate social responsibility in Nepal is mainly limited (44%) and even moderate (18%). Another 14% found it insignificant, while only 9% judged it to be significant. The few corporate organisations that contribute financial support to civil society in Nepal have established hospitals, supported schools and colleges, or launched environmental improvement programmes as charity activities. Corporate philanthropy is allied with their commercial interests. While 15% of financial resources of CSOs come from the government, 79% of respondents stated that more than 10% of their funding came from corporate sources.